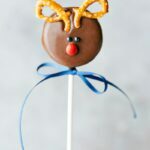 4 adorable and simple to make Christmas oreo pops: a penguin, snowflake, reindeer, and a candy cane. Video tutorial included! Okay fair warning; I may have gone a little overboard this year in adorable Christmas treats (I don’t know though, is that even a thing?!). 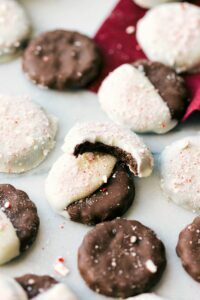 We’ve got 4 Christmas Oreo pops today, 4 tomorrow, and next week I’ve got some Christmas Oreo truffles headed your way. Today: Penguins, Snowflake, Rudolph, and a Candy Cane!! 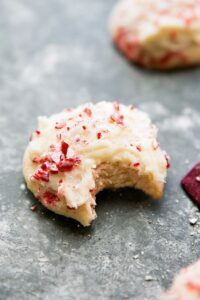 Each with only FIVE ingredients or less. There is a video tutorial above this text and below are specific instructions for each of these pops. 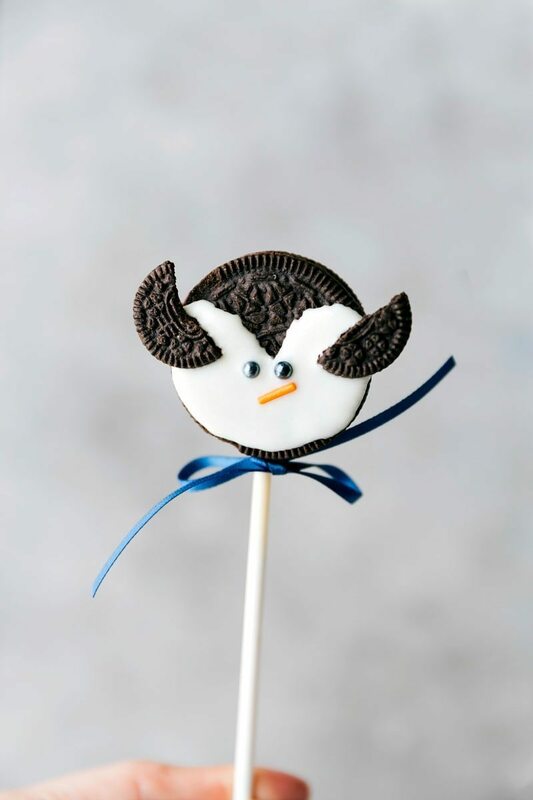 🙂 Note that each recipe makes about 20-25 Oreo pops so if you want to do a variety of the pops then you’ll want to halve (or third or forth) each of the individual recipes. Also, if you’re looking for the cake pop holder (used in the video) I love and highly recommend this Nordic Ware one ! (<– click on text). You’ll also want to have parchment paper to lay all of these pops on (after making them) so they can harden, but be pulled up easily. Enjoy! I guess I can see it though ?. When I responded, “It’s a penguin. Halloween was over a month ago,” he just shrugged and said, “You were making Christmas stuff back at Halloween time.” Very fair point. ? If using chocolate chips add about 1/2 teaspoon vegetable oil (more if needed to thin it even more). Dip one end of the lollipop stick into the melted chocolate and press that side into the cream side of the oreo. Transfer the remaining melted chocolate to a plastic bag and snip off the very tip with scissors. "Pipe" the melted white chocolate to form a heart shape on the bottom section of the oreo (see video). Fill in the heart shape with the melted chocolate and then gently shake the oreo to make the chocolate even. Separate and then break a miniature oreo in 2 pieces. Press one piece on one side and the other piece on the other side. Hold to secure. 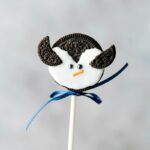 Press 2 black pearl sprinkles in the center of the oreo to form eyes. Press 1 orange jimmie sprinkle below the eyes to form a beak. Next: a SNOWFLAKE. These are super simple and so pretty. I used blue as a background color, but really any darker color will be pretty with a snowflake on it. Red, green, purple, etc. Separate the blue candy melts into 3 parts (this is to keep it from getting hard while you decorate) and place each section in a microwave safe bowl. 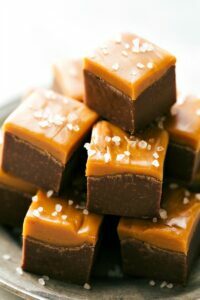 To make the chocolate easier to work with about 1/2 teaspoon vegetable oil to each section of chocolate (you can add more later if needed to thin it even more). Place the oreo on top of a fork over the bowl of melted chocolate. Use a spoon to spoon chocolate over the oreo. Shake the fork gently on the edge of the bowl until the chocolate forms an even layer. Set aside and allow to completely harden. 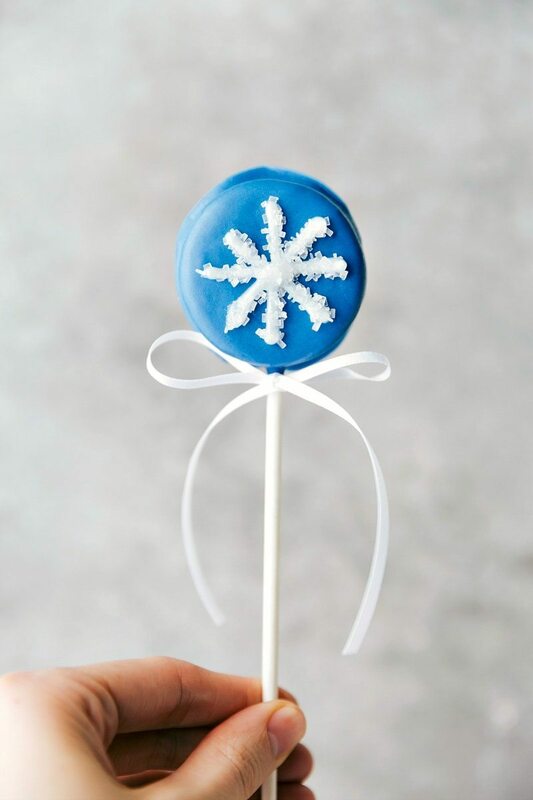 Once hard, pipe the shape of a snowflake on the pop using the white decorating gel. 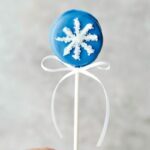 Sprinkle white sparkling sugar over the snowflake and then tap the pop to remove excess sprinkles. The “nose” is a miniature red M&M. I’d noticed some new (or new to me) “baking bits” M&M’s (they are just miniature M&M’s) by the chocolate chips in the baking aisle which is awesome because miniature M&M’s can sometimes be hard to track down! 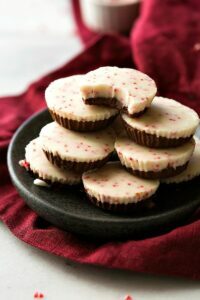 Separate the chocolate into 3 parts (this is to keep it from getting hard while you decorate) and place each section in a microwave safe bowl. 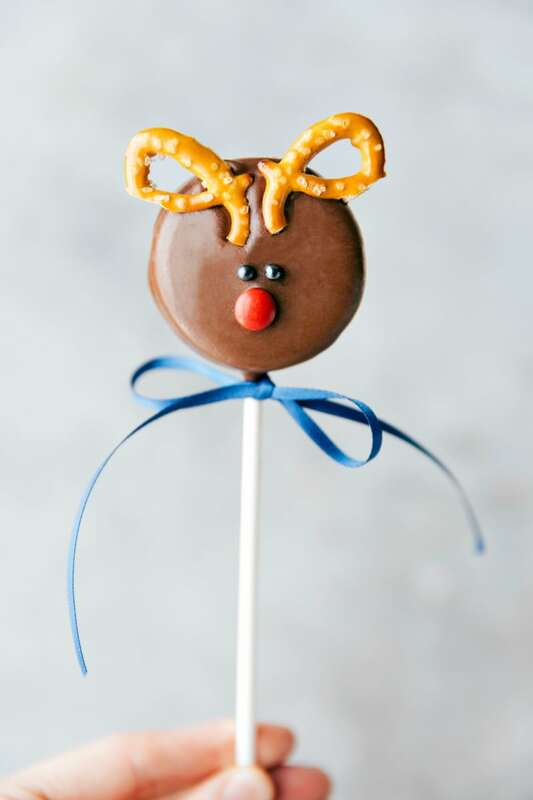 Drop 2 pearl sprinkles below the antlers. Drop 1 red M&M below the sprinkles to form the nose. 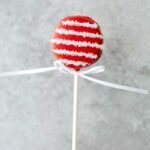 Last: a CANDY CANE. This started out as a Santa Claus, but after drawing a black stripe across the center (belt) and putting a yellow candy in the center (buckle) it just looked like a Pokemon ball. ? 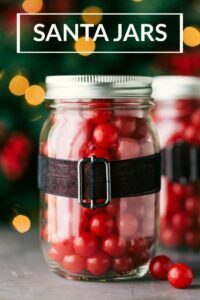 Separate the red candy melts into 3 parts (this is to keep it from getting hard while you decorate) and place each section in a microwave safe bowl. Once the chocolate is set, pipe 5 lines across the oreo using the white decorating gel. 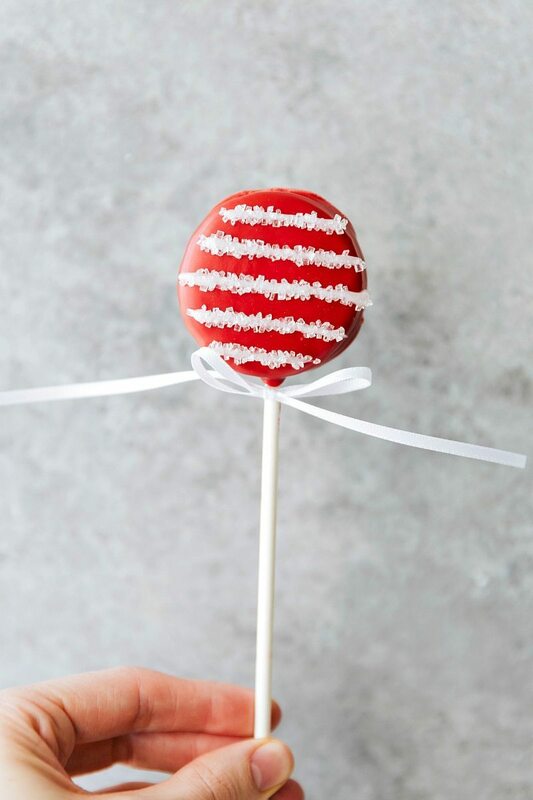 Sprinkle white sparkling sugar over the lines and then tap the pop to remove excess sprinkles. OMG! How cute are these! Love it. I never get tired of saying YOU’RE SO TALENT! Wow… I loooove all treats you make, Chelsea! And I can’t think of anything cuter right now! These are so cute! Love your ideas! Can I make them a week in advance. Would the oreo get soggy? I would only recommend making them 1-2 days in advance; they are more stale tasting than soggy longer than that.